Though 'Ghostbusters' might not have spawned a franchise as hoped, it's a fun couple hours of your time. When there’s something strange in your neighborhood, who ya gonna call? This summer, we’re calling Kristen Wiig, Melissa McCarthy, Kate McKinnon, Chris Hemsworth (in a potential career-changing role) and Leslie Jones (in a potential career-making role). When I hear that a beloved movie from my childhood is getting the reboot treatment, I usually start trembling in fear – and my fears are usually realized. When the Ghostbusters reboot was announced, I had hope for once. The reunion of Paul Feig, Kristen Wiig and Melissa McCarthy from Bridesmaids seemed promising. Erin Gilbert (Wiig) and Abby Yates (McCarthy) are a pair of unheralded authors who write a book positing that ghosts are real. A few years later, Gilbert lands a prestigious teaching position at Columbia University, but her book resurfaces and she is laughed out of academia. When ghosts invade Manhattan, Gilbert reunites with Yates, teaming up with a nuclear engineer, Jillian Holtzmann (McKinnon), and a subway worker, Patty Tolan (Jones), to save the world from a demon known as Rowan (Neil Casey) who can exercise control over human forms. Their hot but not-so-smart receptionist, Chris Hemsworth’s Kevin, helps out, too, but mostly he’s just eye candy, the reverse of a decades-long habit of casting females as hot but not-so-smart receptionists. Any successful sequel or reboot must keep the audience engaged with a new story while mixing in nostalgia that made the original a hit. Director Paul Feig honors the spirit of the original with original stars Bill Murray, Dan Aykroyd, Ernie Hudson, Sigourney Weaver, Annie Potts, Slimer and the Stay Puft Marshmallow Man all gracing the reboot with cameos. On a side note, this isn’t a spoiler – I’ve seen the cameos listed on several websites. A bronze statue of the late Harold Ramis graces the halls of Columbia University, where part of the original and reboot take place. The female ghostbusters have a natural, easy chemistry and, though they all hold their own, it’s Jones who’s the revelation here. Much like McCarthy in Bridesmaids, Jones might be the lesser-known actress who steals the show and goes on to big things herself. That being said, the biggest revelation might be Hemsworth. As likable as the female leads are, it’s Hemsworth who almost steals the entire film. I had no idea he’s such an adept comedian. Though the movie wasn’t exactly the laugh riot along the lines of Bridesmaids, “fun” is the word that first came to mind after it ended. With this being a summer release and all, fun is what we want in a summer film, and Ghostbusters delivers. Not only is the movie fun, the end credits are fun, too. If you’ve ever imagined yourself dancing with Chris Hemsworth, you can live vicariously during the credits. And, as with comic book movies, stay until the very end of the credits. 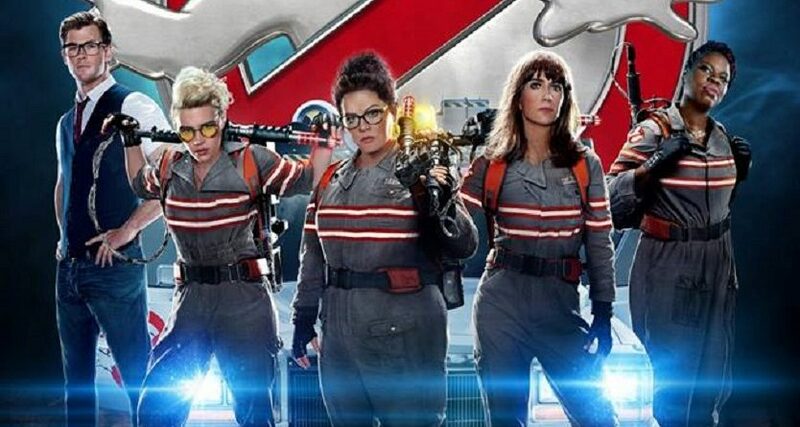 A potential sequel was set up that references the original Ghostbusters. Though it doesn’t look like the sequel will happen, the set-up was intriguing. If there’s something strange in my neighborhood, I’ll gladly call Wiig, McCarthy, McKinnon and Jones. I ain’t afraid of no Ghostbusters reboot.